Customer satisfaction is our utmost priority due to which we efficiently store the entire batch in the well-structured warehouse till the delivery of the orders to the customers. Due to our streamlined packaging system, we are capable of meeting both standard and customized packing needs of the clients. Moreover, we make use of quality packaging material. 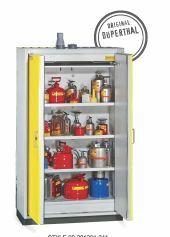 The Flammable Storage Cabinet, delivered by us, is manufactured with great excellence, hence is quality assured.